Signaling growing interest in personalized oncology treatments as well as diagnostics, Roche plans a $2.4 billion acquisition that will expand its majority stake in Foundation Medicine into full ownership of the cancer-focused molecular diagnostics developer. Under the deal, Roche and Foundation Medicine said, they plan to combine their expertise in genomics and molecular information, with the goal of enhancing their development of diagnostics and personalized medicines focused on people with cancer. Roche anticipates leveraging Foundation Medicine’s comprehensive genomic profiling (CGP) testing and innovative data services, while keeping Foundation Medicine as a separate and autonomous company within the Roche Group. “Joining forces with Roche as an independent operating company allows Foundation Medicine to continue its collaboration with Roche, as well as our biopharma partners, to drive ubiquitous access to CGP testing and innovative data services,” Foundation Medicine CEO Troy Cox said in a statement. Cox will report to Daniel O'Day, CEO of Roche’s Pharmaceuticals Division, which accounted for more than three-fourths (77%) or CHF 41.2 billion ($47.8 billion) of Roche’s total CHF 53.3 billion ($61.8 billion) in 2017 sales. Both total Group sales and Pharmaceuticals sales rose 5% from the previous year. The remainder of Roche’s revenues were generated by its Diagnostics Division, which racked up CHF 12.1 billion ($14 billion) in sales, up 5% from 2016, through its centralized and point-of-care solutions, molecular diagnostics, tissue diagnostics, and diabetes care units. Among its product portfolios, Roche Diagnostics’ top-seller was its cobas immunodiagnostics franachise, which generated CHF 3.8 billion ($4.4 billion), up 13% from 2016. “Our management team will remain in place and Troy Cox will remain as CEO,” Foundation Medicine spokeswoman Lee-Ann Murphy told Clinical OMICs. Foundation Medicine would be Roche’s third multi-billion-dollar acquisition. All three deals have focused on Roche expanding in cancer and/or precision medicine: The pharma bought Flatiron Health for $1.9 billion in a deal announced February 15 and completed April 6. And in February, Roche completed its $1.7 billion acquisition of targeted cancer therapeutics developer Ignyta. “Foundation Medicine and Roche share the philosophy that every cancer patient should have access to personalized care informed by validated molecular information,” Cox added. Murphy said Foundation Medicine would retain its headquarters and labs in Cambridge, MA, as well as its labs in Morrisville, NC, and Penzberg, Germany. Foundation Medicine offers services that include a suite of comprehensive genomic profiling (CGP) assays designed to identify the molecular alterations in a patient's cancer and match them with relevant targeted therapies, immunotherapies and clinical trials. Foundation Medicine’s CGP for solid tumor cancers is FoundationOne, which is designed to detect substitutions, insertion and deletion alterations (indels), and copy number alterations in 324 genes and select gene rearrangements. FoundationOne is designed to test for solid tumor cancers that include non-small cell lung cancer (NSCLC), colorectal, breast, ovarian, and melanoma. The assay is also designed to detect genomic signatures, including microsatellite instability and tumor mutational burden, using DNA isolated from formalin-fixed paraffin embedded (FFPE) tumor tissue specimens. Earlier this year, Foundation Medicine launched FoundationOne CDx, the first FDA approved comprehensive genomic profiling assay for all solid tumors incorporating multiple companion diagnostics. The launch quickly followed the Centers for Medicare & Medicaid Services (CMS) issuing a final National Coverage Determination (NCD) in March which allowed Medicare and Medicare Advantage patients to be reimbursed for next generation sequencing (NGS) testing across all solid tumors with Foundation Medicine’s FoundationOne CDx. FoundationACT, a liquid biopsy assay for solid tumors, such as those in NSCLC, breast, colon, and prostate cancers. The assay has been validated to detect all classes of genomic alterations in more than 60 of the most commonly mutated genes in solid tumors using only a blood sample, according to Foundation Medicine. 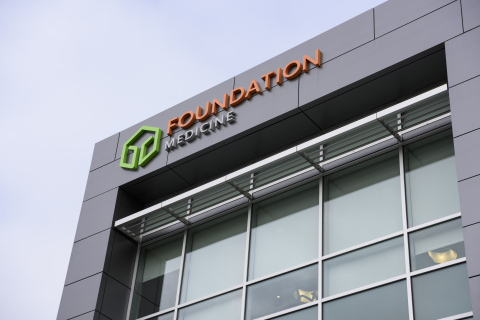 Foundation Medicine finished the first quarter with revenue of $52.84 million, more than double (101%) its Q1 2017 revenue, while the company’s number of clinical tests rose 57% year-over-year, to 21,861. That number includes 17,685 FoundationOne® tests, 2,005 FoundationOne®Heme tests, 2,123 FoundationACT® tests, and 48 FoundationFocus™ CDx BRCA tests. Roche accounted for nearly one-third (30.5% or $16.115 million) of Foundation Medicine’s revenue, with the assay developer recording $14.648 million in related-party molecular information services from Roche, and $1.467 million in related-party pharma research and development services from Roche. Foundation Medicine said it expects to finish this year generating between $200 million and $220 million in revenue—but will end up in the red since it also expects to have operating expenses ranging from $250 million to $260 million. Roche has also been a source of capital to Foundation Medicine, which borrowed $30 million during Q1 under its credit facility agreement with Roche Finance. That capital was roughly half of the approximately $60.3 million in cash and cash equivalents reported by Foundation Medicine at the end of the first quarter.